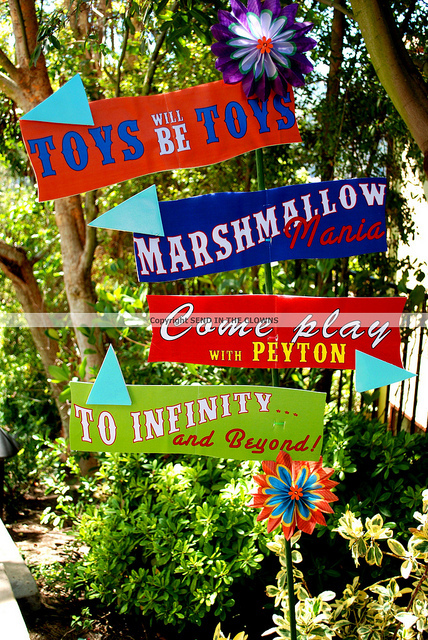 If you're little one is a Buzz or Woody fan, a Toy Story Party is the way to go. Round up all of your cowboys and astronauts for this adventure - "To Infinity and Beyond!" As far as a theme, you can do western or outer space. We say, let's do both! One room can be set up like Pizza Planet (squeeze toy aliens and all), while another could be set up like Woody's Round up (all western feel, with Jessie, Bullseye, and the gang). For the Buzz room, use greens and blues and add in some space ships. For Woody's room, use sheriff gear with reds, yellows, and browns. Activities are a must for kids birthday parties. We found this cute idea of designing cupcakes using Mr.Potato Head features! How much fun would that be for kids?! The next game could be an Army Man Hunt, set up like a scavenger hunt where they look for the army men hidden everywhere. You could also set up a toy story photo booth; have props from the movie set up, as well as proper dress up attire. I loved this cute movie ticket invitation to set the perfect mood for the party. We have included lots of fun activities sure to keep kids busy all afternoon. If you are having a sleepover be sure to have plenty of popcorn and LGM Milkshakes on hand for the Toy Story Movie Marathon!! Jessie Hats - These adorable cookie hats looks so close to Jessie's cowgirl hat they make you do a double take. The instructions call for you to make the sugar cookies yourself, but you could easily substitute a Chips Ahoy to make it even easier. Sunnyside Toy Donation Box - This is a cute decoration with a nod to Toy Story 3, just find toys that are similar to Andy's and fill the box. You could also ask each child to bring a used toy and donate it to Goodwill or the Salvation Army. It's never too early to teach a child the meaning of charity. Cow Balloon - A definite nod to Jessie and her chaps! I am not normally a fan of balloons, but these are so cute and fit perfectly with the theme. Hamm Cake Pops - Straight from the Queen of Cakepops herself - Bakerella. These cakepops are almost too cute to eat! Bullseye's Target Toss - Set up a magnetic dart board with a Bullseye sign, you could even have a prize for the person closest to the Bullseye! Toy Story Birthday Cake - The Cake Mama's have done it again! This Toy Story cake is adorable! Buzz Lightyear Dessert Table - If you birthday boy or girl is a Buzz fan, this dessert table in green, purple and turquoise would be perfect! The pompoms may be a little frilly for a boy, use paper lanterns instead. DIY Mr. Potato Head Cupcakes - Let the kids decorate their own cupcakes like Mr. Potato Head. Use candy eyes, licorice, gumdrops, even cereal for the nose-let your imagination go wild! Jessie's Rope 'Em Lasso Game - A wooden horse and some rope and you've got all you need to start your little buckaroo's a ropin'. Buzz Lightyear's Rocket Launch - Cut a hole in a sturdy piece of cardboard and paint it black, add foam stars and you have the perfect target for foam rockets! The kids will love practicing their rocket launching skills! Woody's Lucky Horseshoes - The cow base on this horseshoe toss is adorable! These horseshoes are made of felt filled with rice. 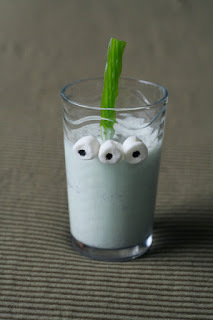 They are sure to be lots of fun for your kids long after the party is over. Door Sign - When your guests see this cute door sign they will definitely know they have arrived to the party! LGM Cakepops - These cakepops would be a great choice, especially if you are new at making them. You can find edible eyes at Walmart, Michaels or Joanne's. Buzz Food Table - Another fun table with a Buzz theme, perhaps a little more masculine. I love the simple banner attached to the front of the table and the tissue paper medallions. For the crafters and DIYers out there here is a video for making your own paper medallions. Etch A Sketch Frame - Mom's always love pictures of their kids, give Mom a gift by taking everyone's picture with this cute Etch A Sketch frame and printing them out before the kids go home. Woody & Jessie's Silverware - I love this idea!! Use a bandanna for a napkin, add your silver ware and put it all in Mason jar with a straw!! Everything is easy to carry, and it's cute too!! Mr. Potato Head Cakepops - Again from Bakerella, these cakepops are adorable!! The colored candy melts can usually be found at Michael's or Joanne's. Buzz Lightyear Snacks - Dipped pretzel for Protons, packaged white M&M's for Booster Fuel and mini chocolate chip cookies for Moon Rocks. Very clever ideas indeed!! Hope you enjoyed out Toy Story Party Board this week!! 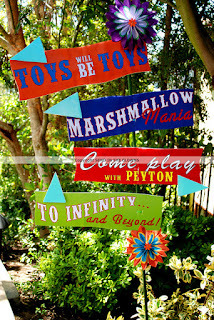 Let us know if you have had a Toy Story party, we would love to see pictures!! For Joey's class party one year, we did Toy Story cupcakes and I used my Cricut to create Green Alien glasses for all the kids. They were really cute and the kids loved them! 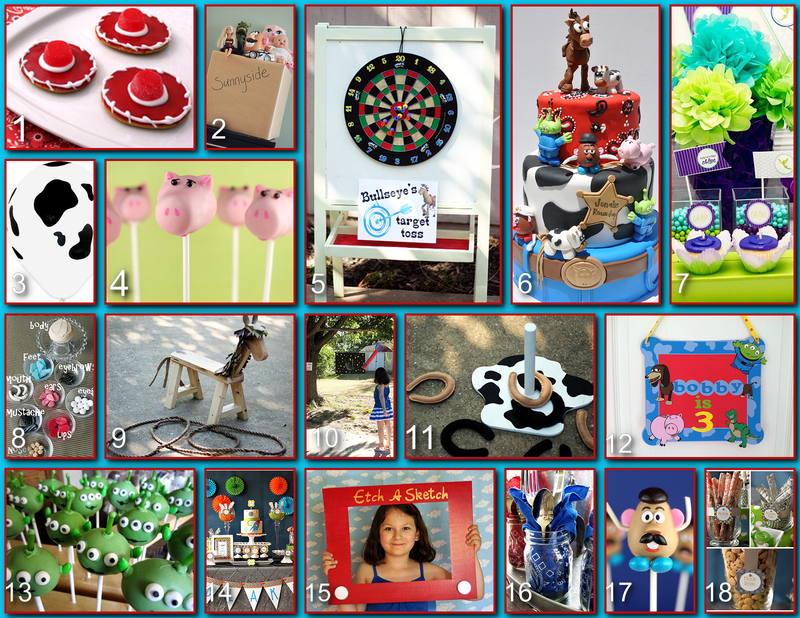 Great party ideas here, love the lasso game! That sounds so fun Beth!! Thanks!! Hehe... I just followed the yellow brick road of links back here... that's my son's birthday invite! So glad you liked it! :) We had such a blast at our Toy Story Party!!! Loved it Liz!! Hopefully you got some hits off of this post!! Merry Christmas! !